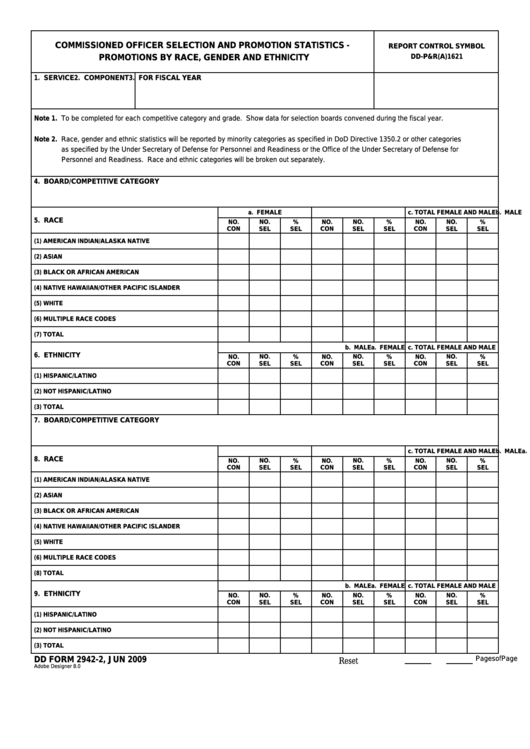 Download a blank fillable Dd Form 2942 - Commissioned Officer Selection And Promotion Statistics - Promotions By Race, Gender And Ethnicity in PDF format just by clicking the "DOWNLOAD PDF" button. Complete Dd Form 2942 - Commissioned Officer Selection And Promotion Statistics - Promotions By Race, Gender And Ethnicity with your personal data - all interactive fields are highlighted in places where you should type, access drop-down lists or select multiple-choice options. Note 1. To be completed for each competitive category and grade. Show data for selection boards convened during the fiscal year. Personnel and Readiness. Race and ethnic categories will be broken out separately.